When you are a childless individual, you look around at women with children, and suddenly you want a baby. We all do it. Hell, I even did it. You think that a baby will make your life better and make it worth something. Yes, those things are true (even more than I care to let on), but what you don't realize is that everything that comes after that pregnancy, is so hard. Even though people have told you. A baby only stays a baby for a little bit, and then after about a year or so, you have a walking, talking, toddler who gets into EVERYTHING on your hands. And it's hard to remain the sane person that you once were. Its hard to remain calm, cool, and collective when you have a three year old screaming for fruit snacks in the middle of Target. But you can do it. It's not easy to hear that your child needs medication for an illness. It's not easy to know you child is in pain, but not be able to do anything for them. It's not easy to leave your child in daycare for eight hours, while you go work to provide for them. I could go on and on, but the point is: parenting is not the easiest job in the world, but it's a job worth doing. two || Parenting is stressful, and that's ok.
Change is always stressful, so you can imagine the stress of having a child. It's alot. Children have a tendency to find your buttons, and continuously push them. It's just what children do. But it's ok. This type of button pushing helps your child figure out his limits (how much can I push Mom before she yells and puts me in time-out), and you to figure out alternative discipline measures. Bottom line is that children need alot of attention and with five million and one other things needing to be done, it can be a tad bit stressful. And that brings me to number 3.
three || Housework and other duties can wait. So what if you haven't had a shower in three days, the sink is full of dishes, the garbage needs to be taken out, blog post need to be written, etc.... they all can wait. Sure you aren't being a neglectful parent by doing these things, and setting you child in front of the TV, but screaming at them because they aren't being quiet and doing what they are told, so you can clean the house, is not fair to the child. Once in awhile it's ok to let the house go, and just be with your child. Forget about all the things and build a train track, do a puzzle, role play with the action figures... just do it. four || Perfection is not attainable. So many parents try to be the "perfect parent", and I have news for them... perfection in nowhere near attainable. But as long as you are giving a hundred and ten percent to your parenting duties, then you are the best parent in the world. Children don't care about their expensive label clothes (well until they get to be teens), the fact that the toy set you just got was from a garage sale, that Mom is wearing the most expensive makeup or her blowout cost over a hundred bucks... they care that you just took time out of your busy day and read them a book or sat down with them to line up and count cars. In the end, it doesn't matter how much you screw up, because in the eye's of your child, you're the best mom in their world. five || It's the small things. The small things make the whole parenting things worth it. It's the hugs just because, the sound of their voice saying your name, the smiles, the small things. Yes, I love being a parent. But I also love reading blogs, so I am also going to share my favorite posts from the week! Welcoming Fall with an Adult Apple Cider by Love the Here and Now. OMG! Anne's alcoholic apple cider looks amazing AND I love the fact she says that she just eyeballed the measurements. Sh*t not to say to a blogger by Whispering Sweet Nothings. Shane seriously read my mind with this post. How to: Thank you notes & a giveaway by Oat and Oats. I love this, especially because I am always writing personalized thank you notes with each order from the Etsy Shop. Irrationally Angry by Helene in Between. Seriously read this post. Helene's face is hilarious. Your Experience Is Not My Experience by The Life of Bon. Um... yeah... LOVE. all 5 of those are soooooo true!!!! sometimes with a four (almost five) year old it's hard to remember to pick my battles when he knows what buttons to push, but we just take it one day at a time. :) Great post, mama! Thanks so much for the feature, have a great weekend love!!! Thank you so much for sharing my post! Hope you make it and enjoy it like I do (as I did last night!!). Thanks for linking up! 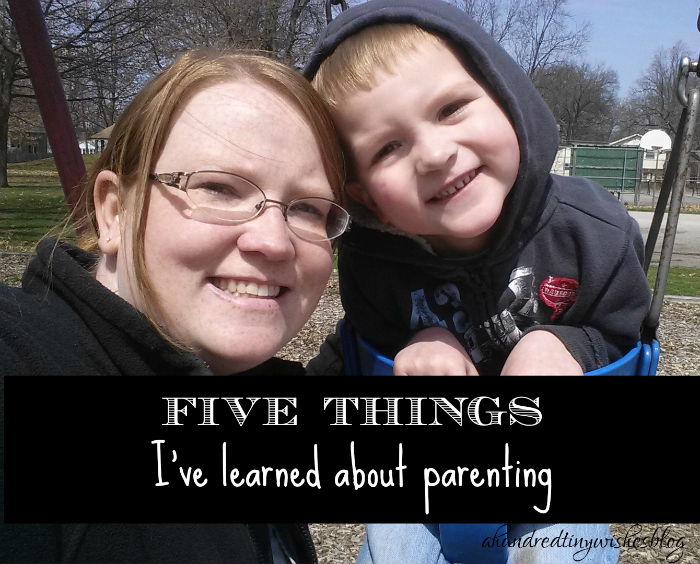 Your list of parenting things? YES. Hope your week is off to a good start! Wonderful post! I am not a parent, but I enjoy reading these types of posts because they're interesting. I like your positive perspective too. :) Hope you and your son have a great Sunday!